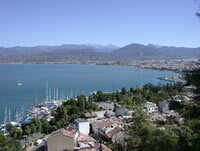 Fethiye embodies all the traditional attractions of the Mediterranean. An ancient site of civilization, remanents of those who have come before are here to be explored. Even Cleopatra found the area worth the visit. 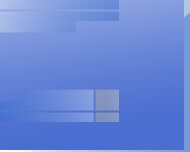 The blue of the Med is legendary, but until it is actually seen first hand, the words are meaningless. The natural features such as the beach at Oludeniz, the Saklikent gorge, Dalyan tortoise beach, Pamukale cotton castle, are found nowhere else in the world, and all are within easy day travel from Fethiye. For those with more modern interests, the challenge will be deciding what to do next. Sailing, swimming, tennis, mini-golf, horse-riding, diving, trek-safari, safari, white-water rafting, canoeing, micro-lights, wind-surfing, and paragliding will compete for your time. For those who seek less energetic pass times, a Turkish bath in the traditional Hamam, sun bathing on the beach or around the pool, a mud bath, a relaxing day on a tour boat around the bay or an overnight trip to Rhodes Island may be more attractive. Fishing from the bank or from a from a boat may bring a glimpse of sea turtles, dolphins or even flying fish. For camera buffs there are endless opportunities with beautiful sea and mountain views in every direction. Shoppers of course are also well catered for and the selection of restaurants and excellent culinary delights could occupy a holiday on their own.